Hosts Mark and Mandy demolished a disused 1930s warehouse, the only commercial building on an otherwise Victorian residential street, and replaced it with a contemporary-style self-build house. Mark, builder and author of the Housebuilder’s Bible, has been interested in low-energy building since the 1970s. 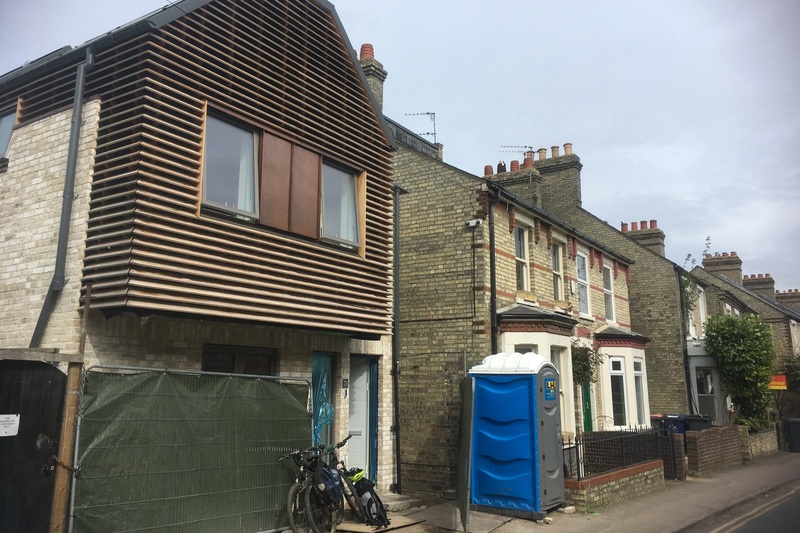 Mark and Mandy balanced conflicting desires, budget considerations and restrictions of the narrow site and decided to go for what could be described as a Passivhaus lite standard known as the Low Energy Building Standard (LEBS). LEBS is still exacting and very much better than current British Building Regulations. The walls are constructed using structural insulated panels (SIPs) manufactured by Kingspan Potton. These are factory manufactured cut to fit wall panels, made up of two OSBs (oriented strand boards) with foam insulation in-between. They are exact, very fast to build and easily achieve good U-values and air tightness. Heating costs are very low compared to most new-builds. There is also a mechanical ventilation and heat recovery (MVHR) unit called Paul. Want to know more about Eco Self Build? Host Mark Brinkley is speaking at our Eco Self-build – make it happen on Wednesday 26th September.